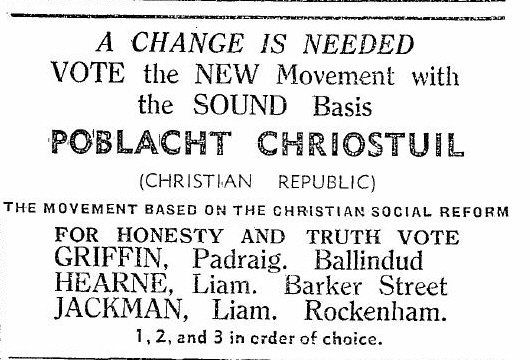 From the 1960 Local Elections an Ad for 3 Poblacht Chríostúil candidates Padraig Griffin, Liam Hearne and Liam Jackman who were running for seats on Waterford Corporation. Griffin polled 102 votes, Hearne 162 votes and Jackman 64 votes with none of them being elected. The second clipping is from the 1965 General Election campaign where Sylvester Cotter and Alex Miller were running in Cork Mid and Cork City. Cotter polled 498 votes whilst Miller polled 547 votes. “2. To foster a resurgence of true patriotism by stimulating interest in public and social administration through the study and application of Christian Social Principles. “3. To prepare candidates for local and national office who will apply these principles for the common good. “4. To oppose all subversive influences into our Christian and National Heritage.